Debs, had to check the 'footer' to see the wine is from DO E-Costa Brava...it's the Catalan DO I know least about. Great post. I like Roses that taste like they had a real relationship with the skins, rather than a nameless quickie in the loo (too graphic?). Another that fits the bill is the Crios Rose of Malbec, for people looking for one that is widely distributed and easy to find. 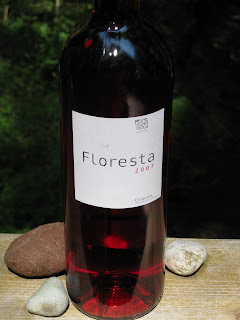 Oh, the Floresta wines are from one of my favorite importers - Beaune Imports! They only have a few Spanish wines in their portfolio but all are fantastic, including the white and red Floresta wines that I tasted a while back. I don't think I tried the rosé, but it sounds delicious! sounds like a great rose, I'll have to look for it. another shimmering vividly colored rose is the Angoves Nine Vines 07 from Australia. Thanks everybody for the other recommendations and for dhonig for the vivid image! Won't forget that in a hurry! DJ, this is my first wine from Emporda-Costa Brava as well and it wasn't even listed as an appellation in most of the resources I checked. Eager to find out more about the wine that's made there.